This is my series about my experience with the Dr. Oz Three Day Detox Cleanse. Check here for my post on why I decided to attempt the the cleanse and how I prepped the ingredients beforehand and here for my experience on Day 1 and Day 2. There isn’t anything special about the dinner smoothie. It’s not bad, but it wasn’t great. The coconut water helps to sweeten the smoothie up a bit but the avocado makes for a weird texture and unappetizing color. The blueberries and kale don’t blend smooth either (at least in my blender) so I found it to be rather gritty. Oh, and the ¼ teaspoon of cayenne pepper is bizarre. It’s not a enough to make the smoothie spicy but it does give it a strange sensation in the aftertaste. It’s hard to describe. Hint: if you a blending in stages, add the cayenne at the start so it fully incorporates into the smoothie. I made the mistake of forgetting it until the end and I didn’t blend well enough. I got a surprise sip that contained a large portion of the ¼ teaspoon! 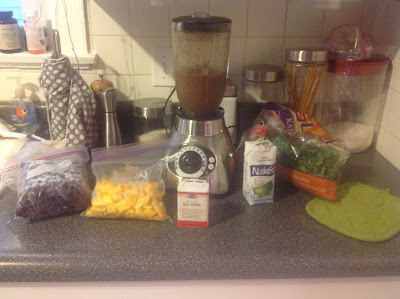 For hunger, this was the most satisfying smoothie. I think the fats in the avocado helped. If you are a mid-day snacker like me, it would make for a good snack smoothie. Day 3 was the worst. Simply terrible. My headache was stronger and my cravings were almost impossible to ignore. I still made it to the gym but felt lethargic during my entire workout. I had a meeting that morning and every restaurant I passed while driving looked delicious. 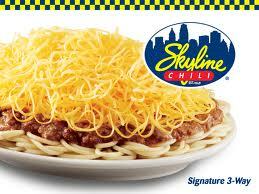 Even Skyline. But I digress. Day three was not good. I just felt crappy. All I could think about was food. I wanted a hot meal. I was sick of cold smoothies. This was not my experience the first time I did the cleanse. Last time, by day three I had lost all cravings. Sure, I wanted to actually chew something, but I wasn’t pining for bread or a Snickers the way I did this time. I almost completed caved at dinner. At the last minute we decided to meet some friends at a local park for barbeque and music. I didn’t have dinner planned for Hubs and Kiddo and after a long week it would be nice to socialize with other families. When we arrived at the park, the smell hit me before we got out of the car. Ribs. My goodness I love ribs. Mac n cheese. Baked Beans. Beer! All my favorite things, right in front of me. I couldn’t help it. While I didn’t get a meal, I did steal 3 macaroni noodles off Max’s plate. I also took a tiny sample of ribs, just to compare them to my own recipe. (Mine were better). At least I refrained from sampling the beer. When we got home, like the night before, I passed out on the couch by 9:30, headache still raging and the thought of eggs and toast in the morning sweetening my dreams. I didn’t even bother with the detox bath. On Facebook, a friend asked if I was doing this to lose weight or to feel better. I was doing this to feel better since after vacation I was feeling bloated and gross. However, this detox is designed to help jumpstart your metabolism, which I need in an effort to start losing weight. Also, weight loss does happen while doing this, since you are eating much cleaner than one normally would. I’ve seen the numbers drop and will give a final total on my wrap up. Jenn asked about the intensity of my workouts during the cleanse. On day one, I didn’t work out at all. It wasn’t on purpose. It was just a busy day. That said, I would probably avoid a major workout on day one since your body is adjusting to the change you spend most of the day wanting to eat solid food. Speaking for myself, a workout would only make me more hungry and likely to give up and eat a solid meal. During the next two days I did light workouts but that was because of extenuating circumstances. The day before the cleanse I tried a new weight routine and destroyed my legs. I spent the next two days limping and cringing every time I had to stand up, sit down or go up stairs. I really couldn’t do anything but some light cardio to loosen me up. If you are doing super long runs or intense workouts I might suggest doing to the cleanse when you can take a break from those things. Maybe by day three you’ll be feeling better, but it could lead to more hunger, thus leading to more temptation. *I realize I just offended most of Cincinnati by hating on a beloved institution. Would I win your love back by saying Graeters is the best ice cream in the world. I’ve had lots of ice cream in lots of places and nothing, not even the most hipster locally owned, milked the cow in the backyard earlier that morning ice cream shop can outshine Graeters. I could eat Buckeye Blitz every day for the rest of my life. So, how did it turn out? Do you feel better. I'm just catching up on my feeds and was thinking about doing the cleanse. Was it worth it? Are you cravings healthier? I wish I could say they were, but they weren't at all. I don't feel any different from when I started. I think I have bigger issues than can be solved by a 3 day detox.